As the Federal Government explores various agribusinesses to diversify the economy, an apiculturist, David Musa, disclosed that honey production can create 10, 000 jobs in three years. This was stated by Musa while speaking at the recent launch of National Apiculture Platform, NAP, where he said the nation stands to rake in high foreign exchange from honey production and export if attention will be given to the industry. 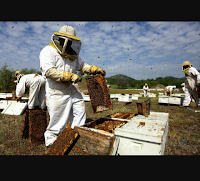 Musa said: “I tend to provide strategic dynamic for Apiculture bee industry in Nigeria. The value of Nigerian bee industry is N36.8 billion with that the bee will also to get better. As stakeholders we have an idea on how to develop the sector. “The honey industry has a lot of prospects to turn around the agriculture sector. We can’t continue importing honey into the country when we have such potential to develop the industry because our import bill is huge, we import 90 per cent of honey into the country, but we can reduce the importation in two years and halt importation in five years. “We can generate up to 10, 000 jobs within three years from bee production in Nigeria. We need to build local houses to generate employment. We need to develop up stream, middle stream and low stream. In the upstream we have producers, middle stream we have the processors and packagers, and the downstream we have the end users and the consumers. “We believe very soon apiculture and bee keeping will effect change in the agricultural sector and make impact in the economy. We need to improve bee nutrition and reduce the price of the commodity. According to him honey has been consumed domestically compared to industrial and urged investors to build capacity in the honey production industry. He also added that apiculture should be included in secondary school curriculum as it will make the students to develop interest and venture into the money spinning industry.